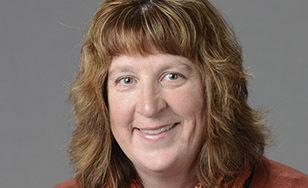 The College of St. Scholastica has named a new dean for its School of Business and Technology. Lynne Hamre will be the next dean of the SBT, effective with the start of the new academic year in the fall. "Dr. Hamre brings both business savvy and technology skills to the position, with a long history of effective service to St. Scholastica as our chief information officer," said Beth Domholdt, vice president for academic affairs. Hamre holds a doctor of business administration degree from the University of Bath in the United Kingdom, along with two degrees from St. Scholastica: a master of arts in management and a bachelor of arts in computer science and information systems. She currently serves as St. Scholastica's Chief Information Officer and for nearly a decade has taught online courses for the SBT, including information technology change management and management information systems. She is a regular presenter at regional and national higher education and technology conferences. She also serves the local community in leadership positions at Grace Lutheran Church in Hermantown and on the board of advisors of the Salvation Army in Duluth, where she is former chair. "I look forward to working with the faculty in continuing to deliver innovative educational opportunities that meet the needs of lifelong learners and prepare them for ethical leadership in the global marketplace," Hamre said. "After 20 years at the College in various Information Technologies and leadership roles, I'm excited to have the opportunity to apply my expertise and experience in new and strategic ways." Until she assumes her new duties at the start of the 2015-16 academic year she'll work with interim SBT dean Jim Gearity to ensure a smooth transition. The College will begin a national search for her replacement in the IT department.